Following some really helpful comments on this poem when I posted it for One Shot Wednesday, I have slightly revised it. I would love to hear whether I have improved it, made it worse or just not made any discernible difference at all! By frost – thick as snow. Follow that single track upwind. Stand sentinel by thorny barricade. Fawn and lifeless – trace it with your eye. This entry was posted in editing works in progress, garden, natural world, poetry, Uncategorized, wildlife and tagged doe, editing poetry, natural world, poetry. writer, revison, wildlife. Bookmark the permalink. Lovely. I think it is perfect now – from the description of the doe to the way you make the reader hold their breath in anticipation of what’s going to happen next. The words you use make the reader hear the silence in which the encounter takes place. Thank you Sandra – I am happier with it now. thank you – the secret moments are magical and usually totally unexpected. I like the revision. It seems clearer to me. I felt the rush of wonder as to what the Doe’s next move was. I liked the feel of motion in the poem. 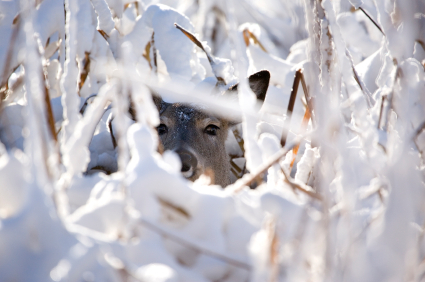 Looking around, finding the doe, seeing her react…. What I dig about this poem is that I feel like I’m the deer, and that I’m running through nature, and then all of a sudden at “Stop” and “Frozen…Fallow…Field,” I’m wary of someone watching me. I notice the speaker, and there is a neat connection between poet, subject and reader. thank you Matt..what is interesting is that when I started to write it, it was about the viewer and it changed over time and with editing. I took a peek at the original just now and I think this is definitely tighter. It’s a vivid piece, very descriptive, and the minimizing helps the focus. That said, your first ending was cleaner, in my opinion, and less choppy. But I’m not a fan of critique, so feel free to pay no mind. ;_) I hate it when people rethink my own poems, and I applaud your courage in actually asking them to. i walk away from it for awhile. I see what you mean about choppiness. I will sleep on it and revisit tomorrow. I think it is tighter Sally but without comparing line for line, it doesn’t seem noticeably different. I agree absolutely, Brian – the poet has the final say, but more data equals greater clarity I think. I love it, if you work somthing too much you can lose the inspiration that birthed it. It reads beatifully out loud. I hear your voice loud and clear. Great job. Nice meeting you in a blog-type of way. You too Henry. Overworking is something I have to remind myself about – often. I am an inveterate fiddler! Thank you for your kind words. Your images, metaphors and word choices are brilliant. Enjoyed it very much, Sally.